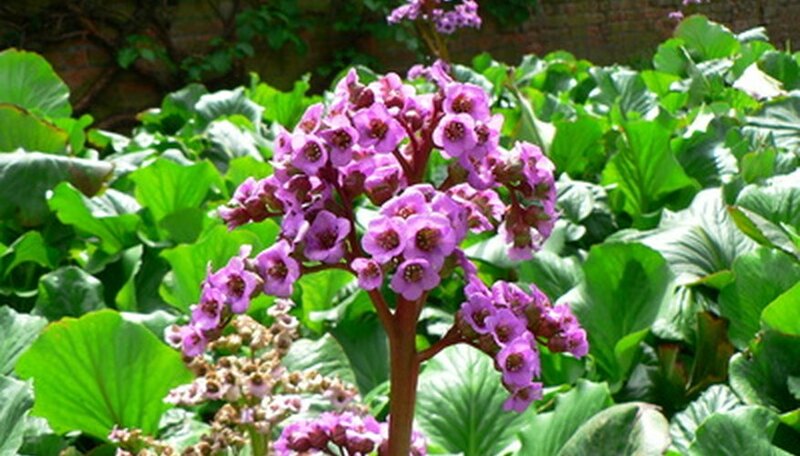 Bergenia are perennials that every spring adorn the garden with bell-shaped flowers that grow atop purple or red stems. They have fleshy, underground root stems called rhizomes, which self-propagate over time. Therefore, you must dig up and divide bergenias approximately every three to four years to keep the garden tidy and prevent overcrowding (which causes bergenias to bloom and grow less). Divide bergenias in the fall after the foliage begins to wither. Dig up the clump of bergenias. They are planted just below the soil’s surface and grow several inches deep. Use a garden fork or trowel and be careful not to cut through the roots. Shake the dirt off gently and wash the roots so you can see what you’re working with. Examine the bergenia roots and begin to separate natural divisions with your hands. Cut the natural divisions with a sharp utility knife. Each section should have a healthy, plump rhizome attached to a crown. Discard old and shriveled rhizomes.